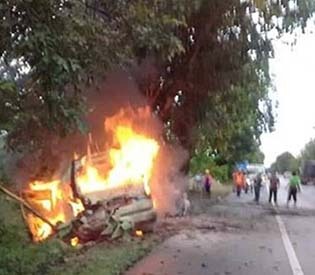 According to Klongkhung district police chief Narakorn Boonkrob, six other passengers in the van, including its driver, were injured in the 7am (local time) accident. “The van was on its way to Mae Sot district in Tak province near Thai-Myanmar border from Petchaburi province (central Thailand) when the accident occurred,” he said. The injured passengers were admitted to a nearby hospital, said Narakorn, adding that two of them sustained serious injuries. Local media reports said the identities of the victims have not been revealed.